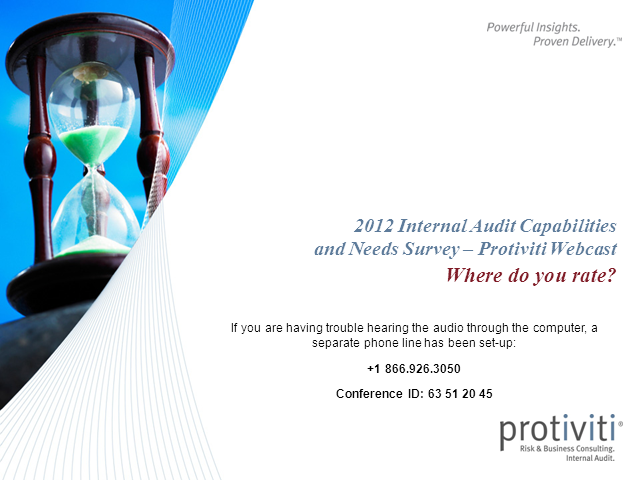 Please join us for a complimentary webinar, Internal Audit Capabilities and Needs: Where do you rate? During this webinar, we will review results from the 2012 Internal Audit Capabilities and Needs Survey and discuss recent trends that have emerged in the past year. Technology continues to be a key enabler and catalyst in business today, helping companies achieve greater efficiencies, productivity and profitability. At every turn, from the supply chain and production floor to back-office administration and even the C-suite, technology is a pervasive and, far more often than not, indispensable asset. Without question, technological advancement in virtually every organization is creating a wealth of new challenges, along with opportunities, for chief audit executives and internal audit professionals. Protiviti conducts its annual Internal Audit Capabilities and Needs Survey to assess internal audit competencies and priorities given the growth in demand for technology skills. Participants, including CAEs, internal audit directors, managers and staff, answered close to 200 questions in four categories: General Technical Knowledge, Audit Process Knowledge, Personal Skills and Capabilities, and Technology and the Audit Process. Brian Christensen, Bob Hirth, David Brand and Robyn Arnell, VP & CAE, Starwood Hotels & Resorts Worldwide, Inc. Presented by: Brian Christensen, Bob Hirth, David Brand and Robyn Arnell, VP & CAE, Starwood Hotels & Resorts Worldwide, Inc.